DNA IS A LANGUAGE SAYS SCIENTISTS. In the simplest single cell of bacteria, there is as much information as there is in every book in each of three metropolitan libraries combined. If all the DNA in your body were placed end-to-end, it would stretch from here to the Moon more than 500,000 times! In book form, that information would completely fill the Grand Canyon more than 75 times! 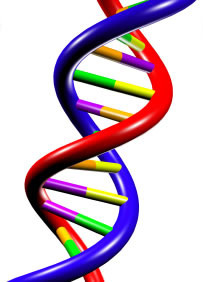 Understanding DNA is just one small reason for believing you are "fearfully and wonderfully made." (Psalms 139:14)...Molecular biology has now uncovered an analogy between DNA and written human languages. It is more than an analogy, in fact: in terms of structure, the two are "mathematically identical." (In other words, its not analogous to a language--it IS a language).The truth is, once the nature of DNA became known, all naturalistic explanations for the universe and for life on earth were dead..